China’s rising economy continues to attract entrepreneurs across the globe. While there are countless resources online that can help you enter the Chinese market, there is less information available about the China advertising law. As a marketer or entrepreneur, it’s vital for you to know the legal restrictions you face in China. 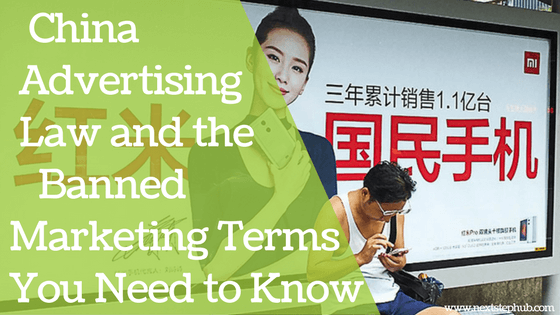 So for today’s post, we’ll discuss the China advertising law and how it will affect your marketing strategies. What is China Advertising Law? On September 1, 2015, the People’s Republic of China modified its Advertising Law. The amended policy simply prohibits the use of superlative adjectives in advertising. Companies and organizations are discouraged to utilize marketing phrases such as “the highest”, “the best” or “most powerful”. Under the local advertising law, the direct Chinese translations of superlative adjectives are also not allowed. The policy proclaims that a company’s advertising statement must be measurable and possible to prove. If a brand’s claims cannot be proven, this will be deemed misleading, which violates the advertising code. The degree of punishments for violations of advertising law can carry fines from 200,000 yuan (US$31,000) to 1,000,000 yuan (US$151,000) – as well as the risk of having one’s business license revoked. Even the giant companies are not safe from this strict rule. Xiaomi Inc, one of China’s largest electronics companies and world’s fifth largest smartphone maker, was investigated by Beijing officials. They used the banned marketing terms like “the best” and “the most advanced” on their website. To avoid the same fate, you must take note of the marketing languages that are forbidden to use in China. Here are some of them. China’s ban on using superlatives in advertising might shock entrepreneurs who are accustomed to marketing in the West. The marketing language in the West are strong and emotional, and superlative adjectives are commonly found in marketing materials. But if you want to be part of the Chinese business scene, you must obey their rules. When translating content from one language, it’s not enough that you know your audience. You also have to be aware of the local laws. It’s wise to seek professional legal advice from lawyers who specialize in Chinese advertising law. Doing so will not only save you from being fined or losing your business license. It will also help you find the right balance between publicity and compliance. Have you run into advertising law issues when translating marketing material in China? What do you think of China’s advertising law? Tell us in the comments! The article “Banned Marketing Terms You Can’t Use In China” was written by Hi-Com Asia.